Once upon a time I used to have every edition of the UK pop bible Smash Hits! but then, my family moved house and every issue, yes every issue, was burnt in a big bonfire! It was truly one of the most tragic moments of my life! In 2008, however, there is e-bay and issues dating back to the end of the 1970's can still be bought and kept away from bonfires. Smash Hits! was a perfect music magazine. Each fortnight, I used to buy my copy in my Uncle Tom's newsagent in Kilkenny. The covers were very often amazing and beginning this week I'm going to start a Strike Curious Poses, "Smash Hits! Classic Cover" section. The first classic Smash Hits! 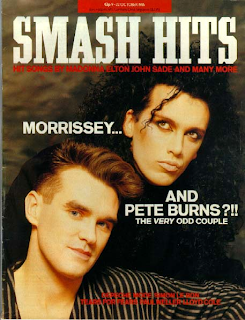 cover features Pete Burns and Morrissey. Dead or Alive were at the height of their fame at the time when the photograph above was taken in October 1995. Morrissey was still in The Smiths and that year The Smiths had released 4 singles, including their most recent single then; "The Boy With The Thorn In His Side". In January of 1985 The Smiths had released the song that would become one of their finest moments; "How Soon Is Now". In 1985 Pete Burns was at his most fabulous in his band, Dead or Alive. The Stock, Aitken and Waterman produced single, "You Spin Me Round (Like A Record)" had gotten to number one in March and their album "Youthquake" had some perfect pop songs such as "Lover Come Back To Me", "My Heart Goes Bang" and the song featured on video below; "In Too Deep". Ne-Yo is currently number one in the UK with his single "Closer". 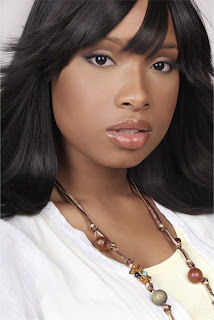 He is also a co-writer and co-producer on the new single, "Spotlight" by Jennifer Hudson. This is currently available on download only in the US but hopefully will be released worldwide as well. It deserves to be a big hit. It reminds me of the type of big R'n'B ballads that were in the charts well before the days of Destiny's Child. Jennifer's self titled album is released on September 30th. The video for "Spotlight" has just been released and is featured below. 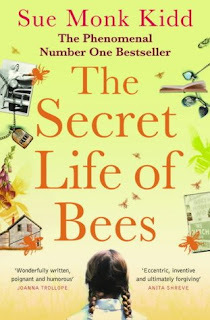 Jennifer will next star in the film adaptation of "The Secret Life of Bees", the much loved novel by Sue Monk Kidd. Jennifer plays the central role of Rosaleen Daise, the carer and friend of Lily Owens (Dakota Fanning), a young girl who is trying to get over the death of her mother. The film is directed by Gina Prince-Bythewood and co-stars Paul Bethany, Queen Latifah and Alicia Keys. It should get a lot of publicity when it's released this Autumn. The Culture Club song "Colour by Numbers" would never appear on the album of the same name in 1983. Instead it would be part of the re-mastered edition of the "Colours by Numbers" album in 2003. It was, however, the b-side to what is, I think, Culture Club's greatest single. That is, the song "Victims". The video was a fantastic, over the top affair and captured all that was fab about Culture Club at the time. "Victims" was the follow up single to "Karma Chameleon" which had been number one in 12 countries in the world earlier that year. 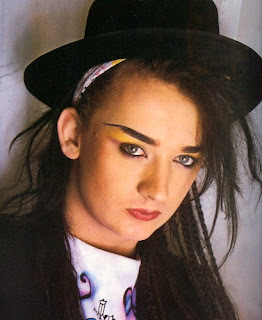 "Karma Chameleon" was the true definition of a worldwide hit as it was a hit in several European countries, including Ireland, Australia, Japan and their only number one hit in the US. 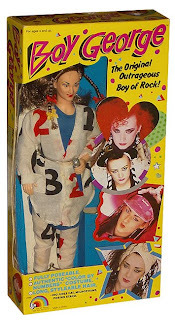 It made Boy George a huge star in America where he would be immortalised, years later, in doll form, as seen below. I have always thought that Boy George was one of the greatest pop songwriters of his day, the other person being George Michael. "Careless Whisper" was released in America as a song by Wham! featuring George Michael. By the early 1990's and after the success of the "Faith" album, George Michael was an even bigger solo star than he was in his days with Andrew in Wham! 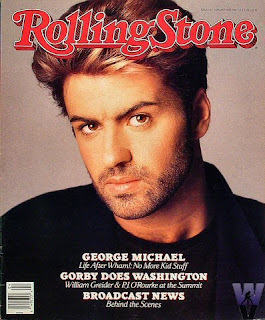 The serious, bearded George on the "Rolling Stone" cover below has the sub heading; "Life after Wham! No more kid stuff". This year George Michael tours America again and these days he performs a mixture of his adult and "kid" stuff as he preforms both his solo work and songs from his time in Wham! Back in 1991 George Michael toured the US and on October 1st 1991 in Oakland-Alameda County Arena he sang his own version of Culture Club's "Victims". It is a gorgeous version. I will always like Boy George's vocals the most on that song but George Michael's version is as good. There are some videos of concert footage of George singing "Victims" on Youtube but the quality isn't good so the clip below is live audio only. In "Hors De Prix" ("Priceless"), Gad Elmaleh plays Jean, a bartender in a luxury Cote d'Azur hotel. One evening while waiting on a late night hotel guest, Jean accepts the offer of a drink and expensive cigar and falls asleep in the bar. He is discovered, alone, by Irene (Audrey Tautou) who is also staying in the hotel with her lover Jacques(Vernon Dobcheff). Irene mistakes Jean for a millionaire and Jean, after failing to make her realise he is the bartender, plays along with the mistaken identity. They get drunk, she makes a pass at him and they spend the night in the best suite in the hotel, which he has access to. A year later Irene and Jacques are back in the same hotel, Jean still works there and once again Jean pretends to be someone he's not. They end up in the suite again while Jacques is oblivious to what's going on, or so Irene thinks. Of course the truth of his charade, comes out quicker than Jean hopes for. Irene is dumped by Jacques and she takes the train to Nice, spending hours dialling numbers from her address book of potential suitors with whom she has various brief connections with in the past. Jean, love struck, follows Irene to Nice and in the space of one evening she manages to spend Jean's entire life savings. By morning, Jean has transferred all his life's savings, even his pension, to buy mere hours of having Irene in his life. In order to avoid being arrested in the hotel foyer for failing to pay his bill, Jean, somehow, ends up as a gigolo for an older rich socialite, Madeleine (Marie-Christine Adam). "Hors de Prix" is a film I wanted to like but instead it ended up being one of the most depressing films I have seen in a long time. "Hors De Prix" is the arthouse equivalent of a romantic comedy. Or rather what arthouse cinema thinks is a romantic comedy. I am always intrigued by the imagery used in the publicity for movies. The poster above has the tag line; "She only dated men with money...until she met a man with a heart". Four male arms, offering expensive gifts, bribes, surround the elfin Irene. In reality, the two men who supply Irene with the luxuries she desires are, while both fairly decent men, are also Grandfather old and more than just the stereotypical sugar daddy. Irene is described as a gold-digger and opportunist in write ups of the film but what she is simply a prostitute. After Irene makes Jean a pauper, he too becomes one to avoid a prison sentence. Very few of the production photos feature the characters of Jacques or Madeleine, instead centring on the main protagonists of the story. In the photo below, Irene is centre stage while Jacques looks on, blurred in the close distance, in an almost voyeuristic shot. Interestingly, the shot is the same as the poster at the beginning of this article and this one below also erases Jacques to create a specific image. Whereas the imagery of Irene and Jean, as below, is much more romanticised. I watched a review of "Hors de Prix" on the Irish arts and culture TV programme, "The View", where the host John Kelly was obviously a big fan of the beauty of Audrey Tautou and the two male reviewers were also praising the film, it was left to the sole female panellist the journalist Anne-Marie Hourihane to say of Irene and Jean; "They're whores!". If "Hors de Prix" was a mainstream Hollywood film, it would have been torn apart by a panel like this. There has been countless depictions of prostitutes in cinema but I found the characters of Irene and Jean two of the most depressing portrayals I have seen. The earlier scene where Irene finds Jean alone in the bar and he pretends to be a bar man and makes Irene a cocktail was the first moment I knew the film was going to be ridiculous. Irene's character is not a stupid one and the fact that she didn't guess who he was straight away was unbelievable. The sad reality is that bar pursuing rich old men to attain a glamourous lifestyle, Irene has no idea of how to fend for herself. There is an especially sad scene where she ends up locked out of her hotel room, not for the first time, and she sits alone on a deckchair in a sarong and bikini top, freezing and waiting waiting for Jean to, financially, rescue her again. The love, or lust, that Jean has convinced himself that he has for Irene is a very tragic one. Bar her good looks and waif like appearance, there is nothing appealing about her character. Both Irene and Jean are owned by other people, no matter how many mind games they play with them. Both Audrey Tautou and Gad Elmaleh look beautiful in the film, and Marie-Christine Adam has an icy beauty too but the viewer is never in doubt as to who has and has not in the film. Gad Elmaleh in particular has a great movie star look and is of the two leads, the better comedic actor. He was born in Casablanca, Morocco and is well known in France for his film, stage and stand up comedy performances. The film has been compared to classics like "Breakfast at Tiffany's" but while it has touches of the screwball comedies of the 1950's and the 1960's which were set in Europe, it has very little in comparison to Blake Edwards 1961 film "Hors de Prix" was released in the US in March this year and made just $1,500,000 at the box office. It has made $26 million to date worldwide. The trailer is below and the film's French website is here.